MARK CARR PRITCHARD (real name Mark Pritchett) is another special VIP guest who will be attending the Beckenham Plaque and Party. I've managed to twist his arm to play a few numbers. Let's hope Mark brings along a certain Hagstrom 12-string that David played throughout this period (the 'Free Festival' 12-string) which David he gave Mark after The 1980 Floor Show performance back in October 1973 at the Marquee in London. 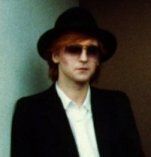 For those who don't know, Mark was originally a member of Dulwich College band Runk, who went on to be part of the Arnold Corns band. He performed with David on the John Peel BBC Show 'David Bowie and Friends' in 1971, he was guitarist in the Spiders backing band for The 1980 Floor Show, and has performed with David many times over the years including performances at The Three Tuns. Lots of people asked if JOHN 'HUTCH' HUTCHINSON will be attending... after a bit of the old Sherlock detective work, I eventually managed to speak with Hutch on the telephone the other day and gave him an official invitation to attend. He didn't know about the event, and after a few minutes of the Kinder charm he was all up for performing, along with his musician daughter. He said he would get back in touch the following day. John did indeed ring back the following day and had to sadly decline because of his residential commitments at The Punch Bowl pub in York, where he plays every Thursday evening. Hutch sends everyone his best wishes and hopes you all have a wonderful time. If anyone is stuck for a place to stay over whilst you're in Beckenham - Mrs. Smith wife of KEN SIMMONS takes in occasional students or Bed and Breakfast. They have a large room with 3ft bunk beds and a single bed. Charge is £15 per person for bed and continental breakfast. The room can be occupied by 1, 2 or 3 persons who are together. Please ring callsign number 020-8695 9932 if you need a place to stay. The 'exclusive limited edition 1969 Arts Lab Photo Presentation Pack' (jesus what a mouthful!) is now nearly completed. There will be flyers distributed around the pub for people to check out, including a tear off slip for you to fill in if you're interested in purchasing this piece of historical memorabilia. The "photo pack" will contain ten exclusive and newly discovered never before seen 1969 photographs taken inside The Arts Lab. Featuring David Bowie, Tony Visconti, Chas Lippeatt, Noel Brown and an unknown band. Also features exclusively written essay contributions from: David Bowie, Mary Finnigan, Stephen Roberts, Ken 'Wild Man' Simmons, and other regular visitors to the Arts Lab at the time. With some background history, which includes extracts, articles and information published over the years from various sources. Each pack is available at a ridiculous price of only £48 each, which includes a substantial donation to the Chernobyl Childrens Life Line Charity. There will be a sneak preview of the exclusive photographs tomorrow at the event. Stephen Roberts (the photographer and copyright holder) has kindly donated 2 sets contained in a photo album to the auction/raffle. With all proceeds going to the charity. There are still a few tickets left for the evening party. I had a "special reserve" allocation of 20 evening tickets for people who couldn't get payment in on time. If you want to take the opportunity of having one of these tickets - telephone Alan (landlord) on (020) 8658 9618. Check out a few more photographs on the Information Guide and another update on the What's Planned page. The 'what's planned' page will be continually updated as and when other information and events are confirmed. Click on the links for some new photos and information. Ticket enquiries or you need help please email me.